Steven (Chicagoland, United States) on 22 November 2010 in Architecture and Portfolio. View of the Milwaukee Art Museum and its outstretched brise-soleil "wings," as seen from the northwest. The cables support the catwalk above this promenade area which brings visitors in from nearby Wisconsin Avenue. Great lines, angles and lighting! When I'm next time in Chicago, Milwaukee is just a trainride away. 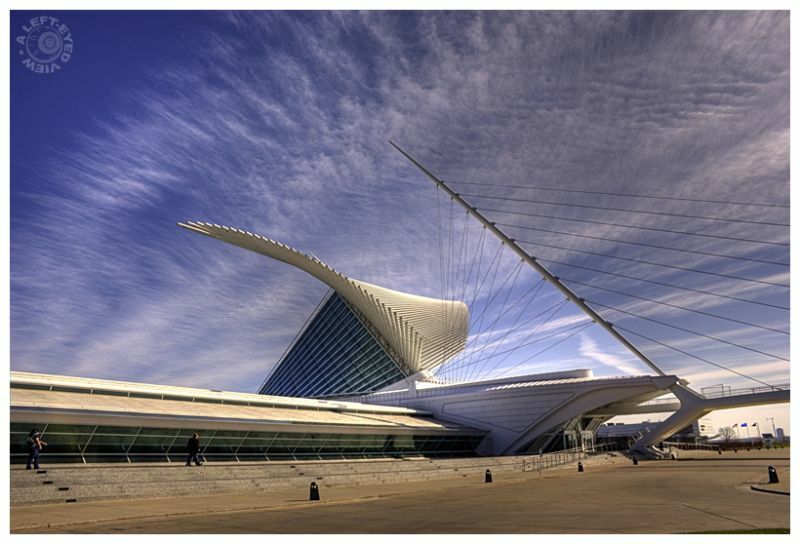 Love the art/architecture of Calatrava. This really is a stunning building Steve. wow.. beautiful.. love the clouds and the entire scene.. superb. Absolutely superb architecture and frame. Nice work ! very strong, in perfect harmony with the sky. I can well imagine this is how Calatrava 'saw' it in his mind . . the sky being fully part of the design. Staggering image, Steven. interesting and bold architecture, with striking lines and curves. the question is, however, is the scale still "human"? This is just magnificent and you caught a really awesome sky too!! Beautiful perspective. Love the sky with the clouds, behind the lines of the building and support wires. Very NICE! A fabulous composition with the clouds and cables. This is a wonderful place. It's somewhere in the middle... Sorry it's a long vid, but it's quite lovely. A fabulous shot of this amazing architecture!